Middle school girls humble their warrior at their beautiful studio at the Simpson Center for Girls in downtown Oakland, Girls Inc. of Alameda County headquarters. Part of my inspiration in seeking yoga training was an intention to bring the practice to under-served populations. 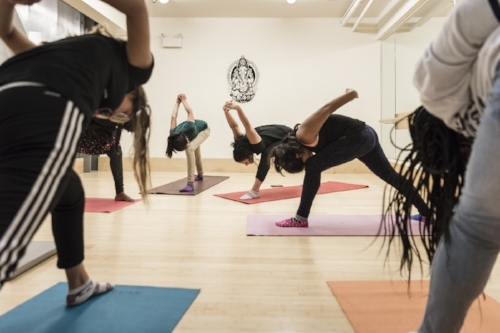 I currently teach yoga at the after school program run by Girls Inc. of Alameda County, an organization that strives to inspire girls to be Strong, Smart and Bold. They're an amazing nonprofit and truly understand the benefits yoga can bring to their population. I've been involved with this program weekly since 2015. In 2018, I also began a partnership with the Partners Program at Oakland College Prep, an initiative to prepare promising at-risk middle school students to succeed in high school and beyond. Please reach out with any additional opportunities to bring yoga to communities in need, particularly in the East Bay. Yoga allows these young women precious moments of self-reflection and the opportunity to build both self confidence and friendship.